Lock in a great price for La Quinta by Wyndham at Zion Park/Springdale – rated 9 by recent guests! Perfect location. Great customer service from front desk. On site laundry facilities. Great place back off the main road. Newer hotel and a great breakfast! Excellent location just outside the National Park. Walking distance to shops and restaurants. Staff was great and breakfast was always good. Great location and views! It was right in the center of town. The shuttle was close by and took us into the park. You could even walk into the park, it's not a very far walk. Staff, large pool and hot tub, ample breakfast room, laundry room, as well as property setting were awesome! Easy access to parking from rooms and having different buildings, rather than one large one, gives an airy and open feeling. Very good breakfast, variety of choices including fruit and low fat options. Friendly staff. Nice pool area. Very convenient to shuttle stop. LOVED the location!!! The room we stayed in was quiet and had a beautiful view with a bench outside of our room. Great little spot to mediate or zone out with your coffee in the morning. Super serene and peaceful. Our room was located upstairs and towards the back area of the property. Staff was very friendly and accommodating. Super walkable area and just minutes from Zion, restaurants, gift shops, grocery store and visitor center. Majority of our time was spent hiking and etc so this was a perfect comfortable landing spot for all our adventures. Just near the national park and comfort & clean room with kind staffs. La Quinta by Wyndham at Zion Park/Springdale This rating is a reflection of how the property compares to the industry standard when it comes to price, facilities and services available. It's based on a self-evaluation by the property. Use this rating to help choose your stay! A flat-screen TV with premium channels is provided in all guest rooms at La Quinta Inn and Suites at Zion Park/Springdale. A microwave, small refrigerator and coffee-making facilities are provided for convenience. 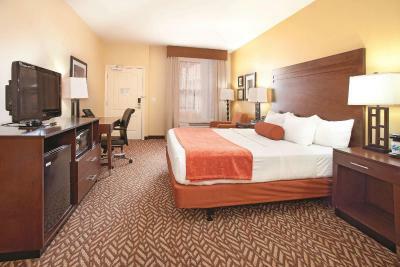 A seasonal outdoor swimming pool, hot tub and fitness center are provided at Zion Park La Quinta Inn and Suites. A 24-hour business center and coin-operated laundry facilities are available. A convenience store is on site. Zion Adventure Company is half a mile away. The Outlets at Zion are 39 miles away. Bryce Canyon National Park is 80 miles from La Quinta Inn and Suites at Zion Park/Springdale. When would you like to stay at La Quinta by Wyndham at Zion Park/Springdale? Free Wi-Fi, a flat-screen TV with premium channels, a microwave, small refrigerator and coffee-making facilities are included in this room. Nestled in Zion Canyon, less than a mile from the beauty and grandeur of Zion National Park, La Quinta Inn and Suites Zion Park Springdale provides you with a convenient location to visit the area’s national parks. Rooms feature refrigerators and microwaves. Enjoy free Ultra Fast wireless internet, daily free Bright Side Breakfast, business and fitness centers, and free parking. Meeting room seats 20. All rooms nonsmoking. House Rules La Quinta by Wyndham at Zion Park/Springdale takes special requests – add in the next step! La Quinta by Wyndham at Zion Park&#47;Springdale accepts these cards and reserves the right to temporarily hold an amount prior to arrival. La Quinta by Wyndham at Zion Park/Springdale accepts these cards and reserves the right to temporarily hold an amount prior to arrival. Guests are also required to sign a pet acknowledgment at check-in. This hotel offers a limited number of pet-free rooms for guests with allergies or otherwise. Contact hotel for further details about pets and the National Park regulations in regards to pets. Pets are not allowed to be left in the room unattended at any time. Maximum of 2 pets not to exceed combined weight of 80 lbs (36.2 kg). Rates a little high, room window rather small—room not bright during the day. A great place to stay and the view in the morning get you all ready for your time in Zion. The rooms were a good size and breakfast was a good selection. Staff very friendly and helpful throughout the stay. Check in process slow, and hotel did not show payment from booking.com. They tried to make me pay again after I had already paid through booking. Location is awesome and grounds are beautiful. Noise level was quite high from room above us, had to wear earplugs to sleep. Pricey for a standard hotel. Bed was too soft for my preference. Sink and tub drained very slow. Could hear plumbing flush of other rooms. Great location. Nice hot tub. Decent breakfast. Great location next to Zion. The shuttle bus stop was just 2 minutes away. Room was super clean and beds were comfortable. Surprisingly nice restaurants close by. Rooms are a little dark, due to window and walkway design, though this does mean they are very cosy :) So much waste at breakfast! Please provide recyclable plates, cups and cutlery. Loved the fruit, but had nothing to cut it with. Waffle service could include fruit-cutting service? The hotel had just implemented a new computer system so check in was long and a bit confusing. Excellent location. Walking distance to the park. Great location. Shuttle bus through town or to Zion National Park just a short walk away. Lots of restaurants & shops. Unfortunately we didn't have time to take advantage of the pool. Good breakfast and selection of food.